Wagner came to the University at Albany on Saturday afternoon and dethroned the undefeated Great Danes in a lopsided 30-0 pounding. After reeling from the effects of Hurricane Sandy on their Staten Island campus, the Wagner College Seahawks came out inspired and fired up. The win marks just the second time Wagner has defeated UAlbany in 16 match-ups. 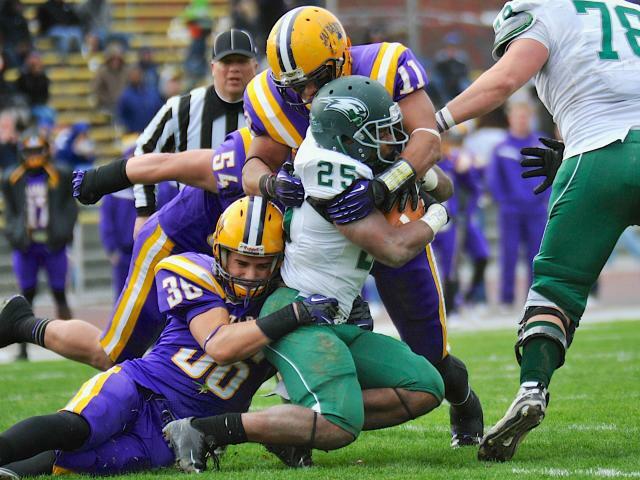 UAlbany was without a few of their top players including the league’s scoring leader, running back Drew Smith. Smith was suspended for the game due to a violation of team rules. The loss snapped UAlbany’s (7-2 overall, 5-1 NEC) five game winning streak and allowed Wagner (6-3, 6-1) to take a half-game lead over them in the Northeast Conference. UAlbany’s typically high functioning offense stalled against Wagner managing just 188 yards and 11 first downs as opposed to Wagner’s 413 offensive yards. “They’ve been averaging 19 points a game—they had 27 at the half. We’ve been averaging 35 points per game and had zero at the end. I think they dominated both lines of scrimmage and that’s usually where games are decided,” said Ford. Wagner won the coin toss and deferred which forced the Danes to play against blustering winds. The wind hampered UAlbany all afternoon as they struggled to get the passing game going and repeatedly gave Wagner solid field position. The Seahawks scored 14 points in the first quarter on an 11-yard rushing touchdown by Dominique Williams and a 2 yard touchdown pass from Nick Doscher to Joe Sidaras, respectively. In the second quarter, Wagner extended their lead on a huge 88-yard pass from Doscher to Anthony Carrington giving them a 20-0 lead. With a 20 point deficit, UAlbany committed a crucial roughing the kicker penalty that eventually resulted in another Wagner touchdown. Williams scampered for seven yards to pay dirt to give Wagner a 27-0 lead heading into the half. Wagner’s stingy defense continued to keep UAlbany throughout the second half never allowing them to maintain an effective drive. Seahawk’s kicker David Lopez made a 40-yard field goal in the third quarter to yield the final 30-0 score. Williams led Wagner with 103 rushing yards and a pair of touchdowns. Doscher completed 10-of-15 passes for 253 yards and two scores. Omar Osbourne, filling the starting role for Drew Smith, had 12 carries for 51 yards. The victory marked Wagner’s sixth in as many games. The Danes are still in contention for the NEC title and look to rebound next Saturday as they travel to Duquesne. Kickoff will be at noon in Pittsburg, PA.
“The challenge is always, always to come back down to earth after a great win, and to pick it up after a devastating loss. We’ll see if we can get it going next week,” said Ford. “We have to put a good work week in this week. We’re not out of it so we just have to get back to playing football,” said Fiacchi.